Vijay‘s ‘Theri’ is not just releasing in Tamil, but also in Telugu simultaneously. According to sources, the Telugu theatrical rights of the movie have been acquired for a good price by ace Tollywood producer Dil Raju. “Raju was impressed a lot after watching the rushes of the movie. Hence, he immediately signed the deal with producer Kalaipuli S Thanu to release the movie in Andhra Pradesh and Telangana,” sources said. 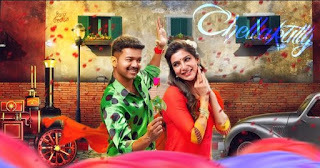 Besides Vijay, the film has Samantha and Amy Jackson, both popular in Tollywood, in lead roles. “These factors will help pull crowds to theatres, prompting Dil Raju to acquire the rights,” sources added. Directed by Atlee, the film has G V Prakash Kumar as music composer and the audio was launched at a grand function in Chennai earlier this week. Plans are on to release the film for Tamil New Year.